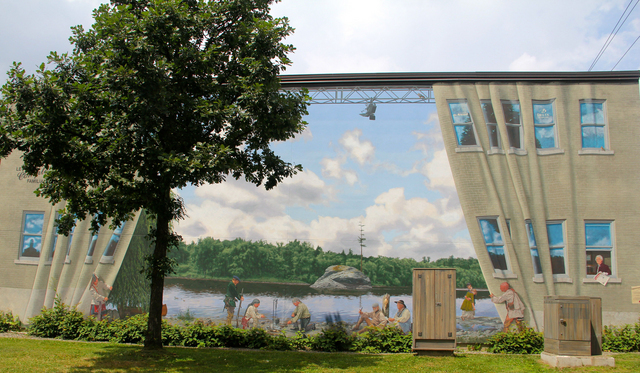 This oversize mural presents facts and legends from the history of the Sherbrooke region. This scene is purely fictional. The foreground features the First Nations pulling back the existing wall like a theatre curtain. Most of these "extras" symbolize the succession of personalities, facts, and legends across several periods of our history, long before Sherbrooke or even Hyatt’s Mill (name of the first village). The characters are assembled on the banks of the strategic Saint-Francis River, right in front of what has come to be a symbol of our region: the solitary pine. The Mena'sen (Abenaki word meaning Rock of the Solitary Pine) is a small island located in the middle of the Saint-François River, 350 meters away from the Saint-François bridge and Terrill Street. This rock commemorates a man-to-man fight between an Abenaki and an Iroquois. It would have been an historical and symbolic confrontation organized by the Grand Chiefs of the two populations. That fight would have happened in 1692. The Abenaki warrior would have won, which would explain why this population was occupying the territory when the first white colonist arrived. The Solitary Pine that decorated the rock disappeared. It would have been cut down by vandals in 1913. In 1934, upon the fourth centenary of Jacques Cartier's date of arrival in Canada, a large metallic and luminous cross was installed there by the Sherbrooke diocese to commemorate Cartier's journey. Legends of Mena'Sen - Find and Seek!